Adorable Gift Set featuring 3 cute 5" Lots to Love Babies. Adorable Gift Set featuring 3 cute 5" Lots to Love Babies. Dolls are all vinyl and bath friendly. Each room of the the reusable playhouse features a different and exciting play accessory. A bathtub for water fun, and a crib for bedtime. 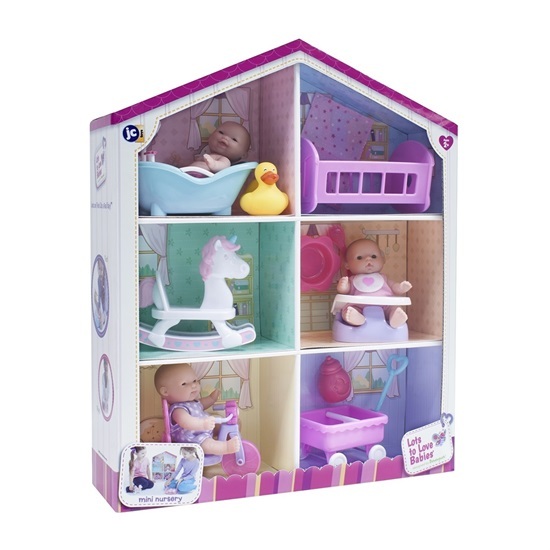 Set features a rocking horse and tricycle for playtime. The wagon lets you take baby everywhere! Doll also comes with a mini potty and feeding set for pretend meal time. All this in a beautifully big gift presentation. This set is perfect for ages 2 and up. This handsome boy is so realistic, you wont believe he is a doll! 17" All-vinyl La Newborn Anatomically Correct "Real Boy" comes with brown hair and baby blue eyes. 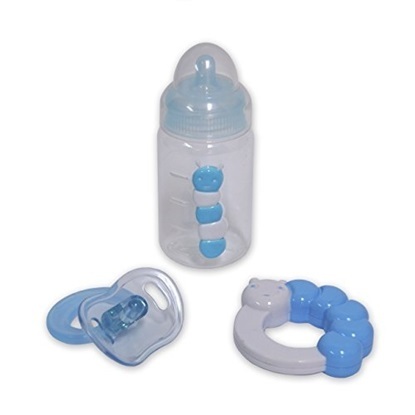 If you are looking for doll accessories for your baby doll this Blue Accessory Gift Set is perfect.